Equinox Truss Booth Lycra White. White lycra cloth for the Equinox Truss Booth. Why people choose Bop DJ. BOP DJ Showrooms. Why people choose us. 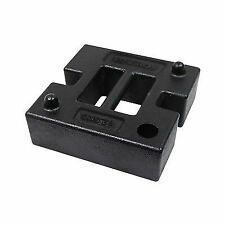 Truss adapter for 35 mm tripod mounts (e.g. for speaker stands) with variable width (11.5 - 31cm). Indentations for common truss systems facilitate set-up and ensure a central position. Supports truss from 115-310mm wide. 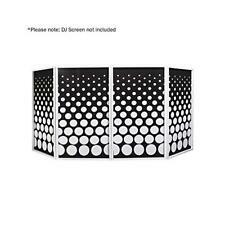 Equinox DJ Booth Replacement Lycra Cloth White EQLED12C. 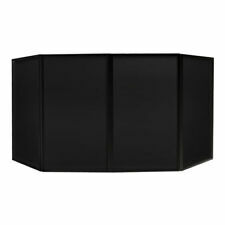 Fits Equinox DJ Screens and other similar products. Graphic style equaliser pattern. Amplifiers & Mixer. Mixer Cases. Fits Equinox DJ Screen (NOT INCLUDED). Weight: 0.2kg (each lycra). Bubble Machines. Graphic style equaliser pattern. Weight: 0.2kg (each lycra). Equinox Truss Booth Overhead Lighting Kit (EQLED150R) inc Warranty. The Equinox Overhead kit for the Equinox DJ Booth (Equinox Product codes: EQLED12P, EQLED12L or EQLED12) allows you to now hang your lighting effects above your DJ stand in one complete solution. 1570-2700 x 1463 x 730mm (overhead kit fixed to the DJ booth). (DJ Screens Not Included). The colours shown behind the screen design require a flood light / bar to create effect. 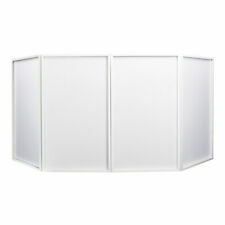 Fits Equinox DJ Screens and other similar products. - Weight: 0.2kg (each lycra). This 1m DJ Plinth Kit is supplied in pairs with all fixings, a white lycra scrim, 35mm speaker adaptor and carry bag. The top plate features bolt holes for securely mounting lighting fixtures, and a 35mm adaptor is supplied that bolts to the top plate allowing speakers to sit safely on top of the plinths. 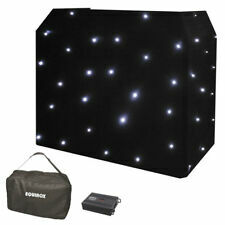 Upgrade your Equinox DJ MICRON Booth with this black starcloth featuring 48 x 5mm LEDs. £49.00 and over £0.00. £25.01 £48.99 £6.95. £15.00 £25.00 £5.95. up to £14.99 £4.50. From To Price. SMOKE BUBBLE MACHINES. The Equinox DJ Booth Boom Box Design Lycra has a retro boombox design that breaks away from the standard covers on the market. Make your booth get noticed and stand out from the crowd - and don't worry about any drinks spillages with this quirky, hand-washable cover. Tool free setup. Black, anodised aluminium finish. Weight 2.9 kg. Compatible with both MKI and MKII DJ Booths. 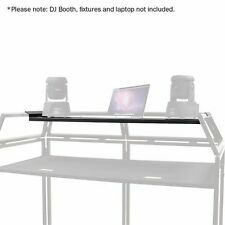 White Overhead kit for the Equinox DJ Booth (Order codes: EQLED12P, EQLED12L or EQLED12). Overhead kit fixed to the DJ booth: 1570-2700 x 2555 x 730 mm. Overhead Kit max. Compatible with both MKI and MKII DJ Booths. 1570-2700 x 2555 x 730mm (overhead kit fixed to the DJ booth). Overhead Kit max. load: 50kg evenly distributed. Why people choose Bop DJ. BOP DJ Showrooms. 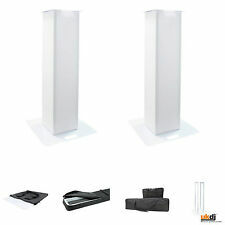 This 1.5m DJ Plinth Kit is supplied in pairs with all fixings, a white lycra scrim, 35mm speaker adaptor and carry bag. The top plate features bolt holes for securely mounting lighting fixtures, and a 35mm adaptor is supplied that bolts to the top plate allowing speakers to sit safely on top of the plinths. 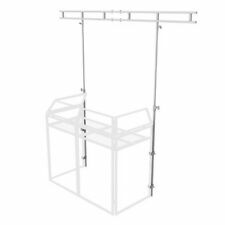 Designed to fit most 4 foot (122cm) deck stands system to hide all your wiring and add a professional image to your set-up. The stretch lycra scrim kit is supplied complete with frontal support bar. 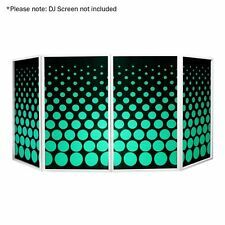 Equinox DJ Booth LED Starcloth System. - IEC power connection. - Sound active, auto run, auto fade, all on and chase modes. - 72 x 5mm white LEDs. Add to Favourites. - Low reflection, fire retardant material. Optional circle design lycra truss scrims. 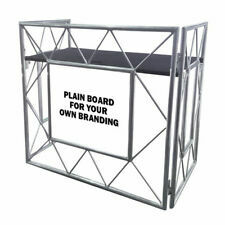 Fits Equinox Truss/DJ Plinths and other similar products. 2215 x 2515 x 710mm (overhead kit fixed to the Truss Booth). Rack Cases. Overhead Kit max. load: 45kg evenly distributed. Stand Accessories. Carry bag included. DMX Lighting. Other Stands.